Home » Blog » You Gotta Seed Now….Seriously. Indeed, your soil needs to breathe just like you do—and that’s why your NH lawn needs fall core aeration and overseeding services. When we at Lawnmark Plus aerate your lawn, we’ll use an aerator that pulls small plugs of soil out of the ground, leaving tiny holes in its wake. These plugs of soil will dissolve back into the ground the next time it rains or when you turn on your lawn sprinkler system. These plugs are beneficial because they too add nutrients back into the soil. Core aeration also breaks up thatch, that layer of dead leaves and roots existing between the ground and green grass layer. Plus, aeration will also break up grass roots. All of this breaking up of thatch and roots helps the soil breathe as well as stimulates grass roots to go deeper into the ground to find moisture and develop food stores to survive the winter. And when we say, breathe, we mean it. Your soil will release carbon dioxide and will be able to receive oxygen, light and water in with aeration. 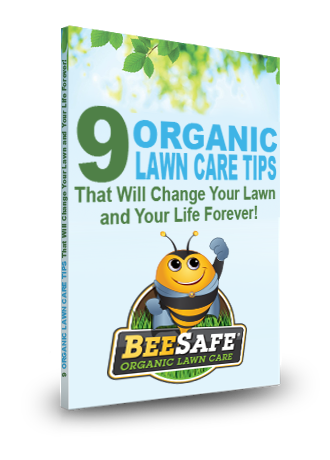 Finally, does your grass have bare and thin areas? Does the soil feel hard when you walk on it? Then your soil may be compacted. Core aeration breaks up soil compaction encouraging robust turf growth, so it feels like a carpet when you walk around your backyard. At Lawnmark Plus, we recommend fall overseeding because the grass seedlings have less competition from weeds compared to the spring. Again, this encourages your new grass to develop those deep root systems and come up dense and green next spring. If you include core aeration with your overseeding service, you’ll see a better return on your investment. By planting deep in the warm soil, your seedlings will be quick to mature, and there will be less seed loss. Also, the fall is a great time to include top dressing with your core aeration and overseeding services. Indeed, the top dressing finishes off the process by adding nutrients necessary to give your lawn a healthy start. Fall is the perfect time to breathe new life into your lawn. If you’re ready for core aeration and overseeding services, call us today at 603-262-1215 or fill out our contact form.